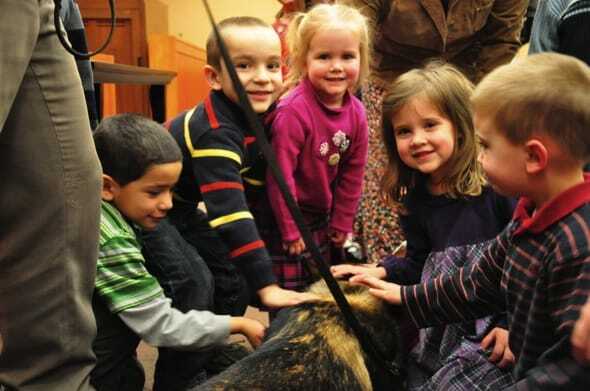 From high school to pre-school, students at Fairhaven Baptist Academy enjoyed having Police Dog Argo and Officer Joseph Dobson visit the school. Argo is from Czechoslovakia and trained here in Indiana for drug and explosive searches and tracking. Argo has been with the Porter County Police department since 2010. After a presentation of what the duties of a police dog are, and a question/answer time, students enjoyed one-on-one time Argo and Officer Dobson. Argo enjoyed his time with the students as well! Pictured (left to right) are: Lydia Perez, Deborah Olson, Maria Alvarado, Catherine Payton, Officer Dobson, Valerie Wright, Amy Brater, Sara Dupre. Pre-School students (left to right): Erick Valladares, Daniel Huske, Bethany Knowles, Ella Almanza, and Brandon Sara.